Perhaps you are looking for a speaker to install in your boat/pool or just for outdoor uses. Either way, a waterproof Bluetooth speaker is the best option. These are speakers that are designed to withstand wetness without ruining their functionality. They can be used in wet exposures like open boats and still work right. 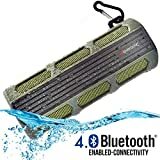 It is important to note that waterproof Bluetooth speakers are different from those that are water resistant. Waterproof speakers are made in a manner that no water passage is allowed in and out of the speaker. Water resistant speakers on the other hand are made of a material that may allow water to pass through, without denaturing the general functionality of the speaker though. Aside from the waterproof aspect of it, it should be noted that the said speakers operate under the Bluetooth technology. This means that music or sound can be played with the help of remote Bluetooth signal. • Portability– One of the key features of Bluetooth speakers is that they are small in size and portable. This comes as an advantage to the user. The small size of the speaker means that they can be carried from one point to another without any inconveniences. • Outdoor Use– The mere fact that these speakers are waterproof means that they can be used in outdoor environment. They are designed to work even in absolute wetness. You can use them by the poolside, in your boat, and anywhere else without any worry of wetness. • Indoor Use– The speakers are not only meant for outdoor use. They can also be used indoors. For instance, you can install them in your bathroom or any other room in your house. • No Cabled Connection– One thing for sure is that wiring can be really hectic when installing speakers in your house. This is something that you are spared of when you opt for water resistance Bluetooth speakers. Note that they operate under the wireless technology. They can therefore receive sound signals remotely. • Multi-purpose– Water resistance Bluetooth speakers are not restricted to one use. They can be used for public address, gaming, and music. This is for the simple fact that they produce great sound. • Signal Problems- You might face some problems with Bluetooth signal. This is because Bluetooth signal is only able to cover a certain scope. If the speaker is far from where the signal is coming from, then it means that transmission will be interrupted. • Not Resistant To Too Much Pressure– It is very important to note that some speakers are only waterproof to a certain extent. In short, too much water pressure may denature the speakers. For instance, if the speaker is submerged deep, water may eventually break through. 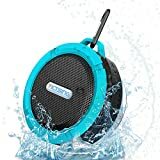 When shopping for a waterproof Bluetooth speaker, it is absolutely necessary to ensure that you are guided by the most appealing review. It is with the help of reviews that we are able to choose the right speaker. This is for the fact that reviews communicate the experience that other people had with the speaker model you intend to buy. 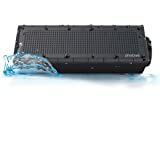 It is among the top rated waterproof Bluetooth speakers yet going at a cheap deal. The speaker is unique in a number of ways. To begin with the speaker has a very strong and sturdy housing. This is seen as a mark of durability. The housing is also a further enhancement of the waterproof feature that the speaker has. In addition, the speaker comes with an in-built battery that can be recharged. The great thing about the battery is that it can support the speaker for 2 hours. Not to mention, the speaker has the capacity to produce undistorted audio even when at its highest frequency. The speaker is considered best for a number of reasons. First, it is rugged with a high quality material that does not only prevent water from going through but also prevents strong shock impacts on the speaker. It can therefore be used in wetness without any problem. Secondly, the speaker operates under the 4.0 Bluetooth technology. This is among the very reliable Bluetooth versions there is. Signal transmission is very efficient, thanks to the Bluetooth technology the speaker operates under. Thirdly, the speaker has a lithium ion rechargeable battery to ensure that it operates remotely for long hours. The general design of the speaker is not only appealing to the eyes but also very promising in terms of offering the best sound. The speaker is considered best for bathroom use and other outdoor activities. 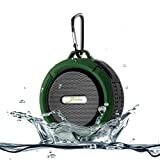 With the waterproof feature, the speaker can work well even in excessive wetness. Aside from that, the speaker operates under the Bluetooth technology, which is again a point of convenience. With the help of the respective signal, the speaker is able to offer you the best sound. The power of this speaker can neither be doubted. Why? It has the power capacity of 5 Watts. This is more than enough to ensure that you enjoy the best audio. The small size of the speaker allows the user to carry it to any place with utmost convenience. The high quality rechargeable battery that the speaker has allows it to play for a long time even in remote areas. The high Bluetooth power gives the speaker the capacity to receive remote audio signals even from afar. The waterproof feature is an assurance that the speaker can be used outdoors even in wetness. It comes in a sleek and compact design for the sake of portability. It can be carried to any place of choice. The speaker is also very versatile since it has a microphone integrated in it. Aside from that, the speaker is able to detect even the weakest Bluetooth signal. Not to mention, the speaker comes with the best battery ever. It is simply amazing that the battery can serve you for 40 hours before recharging.